Wondering if an XPole Is Right For You? The X-Pole is made by a company called Vertical Leisure, with North American offices located in North Hollywood, California. They ship all of their products and dance poles worldwide. 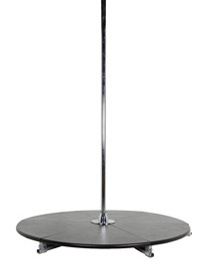 Vertical Leisure makes a number of different models of dance poles to suit almost every need. 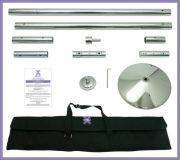 They make an excellent quality platform pole that breaks down for easy transport in a set of included cases, as well as a range of portable, friction fit stationary and rotating poles. These poles can also be converted to semi-permanent (removable) poles with an optional ceiling fixture, and there's even one for vaulted ceilings! Prices range from US $199 for the X-Pole Sport, up to $799 for the X-Stage, which is a totally portable platform dance pole with spin and static settings. Vertical Leisure does not offer a permanent dance pole. If you're installing your X-Pole on a vaulted (sloping) ceiling, you'll need to purchase a special ceiling mount. These are screwed into the ceiling and are available for both the stationary XPole Sport model, as well as for the X-Pert rotating model. The mount shown to the left is the Titanium Gold finish. All mounts are also available in the Silver finish (chrome) to match whichever pole finish you choose. Unless you're planning to buy an X-Stage platform pole, do make sure you measure the ceiling height in all the rooms in which you plan to use your pole. All the XPoles will fit ceiling heights from 7'4" to 9'. If your ceiling is higher than 9', you may need to order an additional part or two, to make sure your pole is the right height to fit your ceiling. If your ceilings are lower than 7'4" (not likely, unless you're installing your pole in a very low basement) you can get a special order pole to fit. All poles made by Vertical Leisure use one of 3 types of installation: friction mount; semi-permanent (requires purchase of optional ceiling mount); or platform, which does not require a top mounting system. The friction pads used on the ceiling pads of both the Sport Pole and the X-Pert are made of silicone. This material provides high grip capabilities, and helps to make these friction mounted poles as safe as possible. The floor pads are similarly made. This extra strong grip is one of the best features of the XPoles. Nonetheless, a friction fit pole is always less secure than a semi-permanent or permanent pole so you should make sure you fully understand the installation procedures for these types of poles. You can read more information about friction fit pole safety here. While the X-Pole is not available in a permanent model, you can convert your existing friction fit XPole Sport or X-Pert pole to a removable, or semi-permanent pole, with the purchase of an optional ceiling plate as shown below. This plate is screwed into a ceiling joist and remains there permanently. The pole can be removed whenever you like. 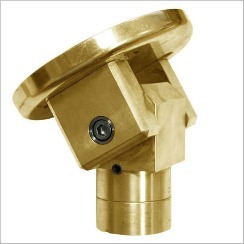 This option offers the safety of a permanently mounted pole, along with the convenience of a removable pole. You will need to purchase your own screws, as the plate doesn't come with these. So be sure to select the correct type of screws for your ceiling construction. The screws can be installed with a manual screw driver, but a power driver will make the job go much quicker. While a platform pole doesn't require any actual installation per se, the X-Stage does require a fair bit of assembly. However, the set up process is actually made quite simple by the unique design. The main difference between the X-Stage Standard and the Lite model is the height of the platform. In the Lite model (shown at left), the rise of the base unit is only 4" off the ground, while on the Standard model the rise is 12". The X-Stage Lite, while still very stable, doesn't have quite the stability of the Standard model. If you're worried about things getting a bit tippy with your X-Stage Lite, you can always extend the legs and add weights to the posts. This can also be done for the standard model. As might be expected, the X-Stage is quite heavy, though the Lite version weighs only about half as much as the Standard version. Fortunately, X-Pole makes it easy for you to transport your platform pole by supplying three carrying cases with the X-Stage, one of which has wheels for the heaviest parts. Nevertheless, do keep the weight factor and set up time in mind if you're considering buying a platform pole, particularly if you're planning to move it from place to place. They're ideal for some applications, particularly outdoors and in venues with very high ceilings, but for home use you're probably better off with either the X-Pole Sport or the X-Pert. 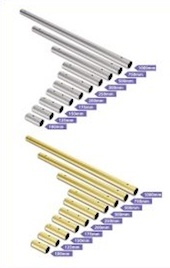 All XPole dance poles are available in your choice of finish, either Chrome, Stainless Steel or Titanium Gold. Some models are also available in powder coated colours (black or pink), brass, or silicone (also in your choice of black or pink). The chrome finish is silver in color and is a good general use pole for both spins and inversions, but it is a different finish than stainless steel. Titanium Gold is gold in color and is made to resemble brass in both look and feel, however if you want a true brass pole be sure to look for that option when ordering. As mentioned earlier, X-Poles can be purchased as rotating poles (X-Pert) or as stationary poles (X-Pole Sport). The X-Pert actually converts from stationary to spinning, so you get the benefits of both types of pole. The X-Stages also have the option to rotate or remain stationary. XPoles are available in a range of diameters, from 1.5 inches (4omm) up to 2 inches (50 mm). Many women find the smaller diameter pole easier to grip. If you are very petite with small hands you might prefer this size of pole. A 2 inch pole used to be the industry standard when pole dancing was more common in strip clubs and bars. The main advantage to this slightly larger pole for home use is that it makes leg holds & inversions much easier as you've got more pole to hold onto with your thighs. All XPoles come as multi-piece dance poles and include carrying cases, making them all technically portable. The cases are soft-sided with handles. There's a fair bit of weight when the case is loaded, but most people should be able to handle it, at least for carrying the pole fairly short distances. The X-Stage comes with 3 carrying cases, the heaviest one with wheels, so this is a big help when lugging this platform pole around! The wheels seem like a good idea at first glance, and in fact it is helpful to be able to pull the heavy case along behind you. Unfortunately, the wheels don't help much when having to deal with stairs or lift the pole in and out of your vehicle. For this reason, do make sure you either have help, or you've devised a system for carefully navigating stairs and vehicle entries/exits when using the X-Stage. At the time of this writing Vertical Leisure's XPoles range in price from $199 - $799. The most economical X-Pole is the XPole Sport, currently priced at $199. This is a stationary, multi-piece friction fit pole that breaks down for storage or transport in the included carrying case. An X-Pole X-Pert pole starts at $289 for the powder coated finish. This is a rotating pole. It is also a multi-piece friction fit pole and comes with its own carrying case. The X-Stage is the most expensive pole at $799, but is well worth it if you need the ability to use your pole anywhere, regardless of ceiling height. The price is the same for the Standard Model (12" high base) or the Lite Model (4" high base). NOTE: Prices and shipping fees can change over time. To ensure you get the most up to date information, please visit the X-Pole website. XPole ships their dance poles within the US, as well as to the following countries via satellite warehouses: Canada, Mexico, UK, Australia, South Africa, New Zealand, Russia, South Korea, China. Orders are generally processed within 24-48 hours, and shipping takes 2-5 days on average. International customers like me will appreciate the fact that there are no customs duties payable on the XPole because of the fact that they are shipped from an in-country warehouse. Every X-Pole comes with a six month warranty against manufacturer's defects when used and installed as directed. 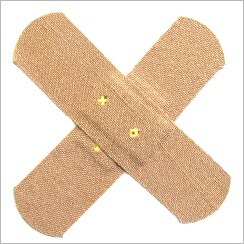 Defects from normal use, wear and tear, being dropped, or anything outside of a pure manufacturing defect are not covered. If you change your mind after receiving your XPole, you may be able to return it within 30 days if it's unopened & unused. A 10% re-stocking fee may be applied. I haven't had occasion to use X-Pole's customer service department, but I find their website very thorough and complete. There are video tutorials covering assembly and maintenance of all their pole models, and contact information is prominently displayed should you have a pre or post-sale question. Was this review helpful? Is the X-Pole dance pole the right pole dancing pole for you? If you decide to order an X-Pole, and you found the information on this page helpful, please consider ordering via any of the links on this page, including this one. I receive a small commission when orders are placed through these links, and it doesn't cost you any more than ordering directly. It's one way I can afford to spend the time to bring you all the free pole dancing info on this website. Thank you! Want to read my other dance pole reviews?